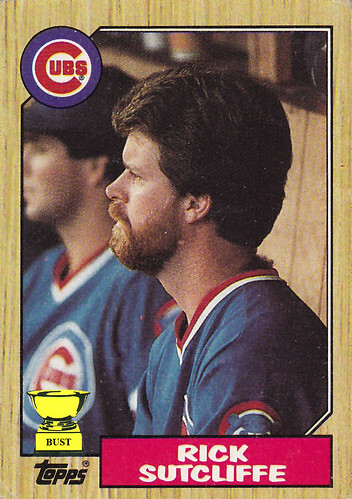 Transcript of a late-night TV ad, circa 1986: "Hey sports fans, Chicago Cubs ace Rick Sutcliffe here for the Hair Helmet®. Whether you're a little-leaguer, a softball beer-leaguer, or a proven big-leaguer like me, the Hair Helmet® is the perfect way to stay safe and stylish, all at the same time! (Cut to shot of Sutcliffe passing hand through hair while getting nailed in head with baseball.) That's right, the Hair Helmet® is a genuine, American-made batting helmet covered with three layers of authentic, human-like hair! It's sturdy enough to stop one of my heaters, but cool enough to grab the attention of the ladies in the crowd. (Cut to shot of mildly attractive woman winking at Sutcliffe.) Available in a variety of colors and styles, the Hair Helmet® is right for everyone! Order now, and we'll throw in the Hair Strap®, a chin strap made of the same hair-like substance as the Hair Helmet®, absolutely free! So take it from me, Rick Sutcliffe. I might handcuff a hitter or ten, but I'll never handcuff my hairdo with anything but the Hair Helmet®." I've had this cards for 25 years and never noticed that tuft of back hair sticking out until now. Thanks?